​It all starts with people who have a love for all animals and the heart to care for them. Coleman was born and raised in Texas. Through many years of working on several ranches he has gained a lot of experience with horses. Starting with the boarding stables where he learned about exercising and the care of all breeds of horses. Venturing to breeding ranches where he received an education about the breeding and birthing of quarter horses and Hanoverian warmbloods. His desire to know more about horse has taken him to a level of showing Arabians professionally. With the experience he had acquired he round-up a manager position at a dressage horse ranch. Horses aren’t the only thing Coleman knows. He also is an actor where he had performed in a few featured films. 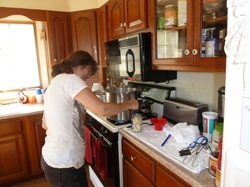 Now as a part of our family here at Calico Junction Mule Ranch we have discovered his culinary skills. 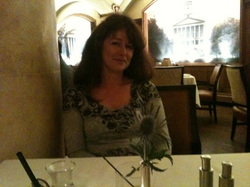 Coleman has several years of management and cooking experience in the restaurant industry. Coleman comes to us with his extensive knowledge of animals and people skills. You can feel the warmth and see the joy he gives and receives while being able to help people of all ages. Coleman has received numerous thank you cards for the great service he has given. Jim and Nancy are proud to have Coleman hang his hat and work with us at our ranch. Coleman and Kaitlin have are a nice asset and bring great value to our team. A quote from Coleman: “I love horse as well as all animals and being a part of a horse rescue ranch and equine therapy care center is an honor. I want to give a smile to all those who come learn and share with us. I enjoy people and interacting with the horse connection. My wife Kaitlin is a manager and an interior designer of a women’s retail store. We believe Calico Junction New Beginnings Ranch and Calico Junction Mule Ranch is a wonderful way to give to a spiritual cause, to be a part of something we love ”. Objective: To help supply the horse industry with well qualified individuals who like working with horses, and have a desire to be self-employed. The training learned here will get them started in an exciting career where learning never stops and where they have control of their future. Qualifications: I worked as a professional farrier for over 35 years. While caring for all of my clients horses I also earned a Master Farrier Certification from the Brotherhood of Working Farriers Assoc. and a Registered Journeyman Certificate from The Guild of Professional Farriers. I also became a Certification tester for both of these Associations. In 1994 I was awarded Tester of the year honors in the B.W.F.A. That year I was also appointed the head of Certification. Education: I earned my High School Diploma from Canton High School, Canton Michigan in 1973. I then attended Michigan School of Horseshoeing earning my diploma that fall. I continued my education with The Laminitis Symposium in 1993, 94, 95, 96, 97. 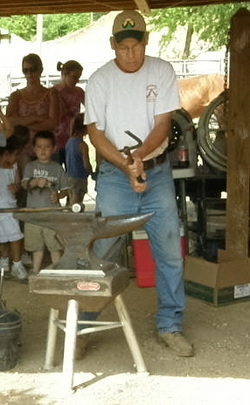 Then in 1994 I attended 2 Bob marshal clinics on forging. Then 2 Denny Young clinics making hand made shoes. I attended 5 American Farriers Assoc. conventions. % International Hoof Care Summits in Cincinnati, Ohio 2006, 08,09, 10, 11 and I am still continuing my education in horseshoeing to date. Other Experience: I shod horses at these farms, Sean Lake Ranch-22 yrs, Grand Cypress Resorts-8 yrs, Ashmore Equestrian Center 10 yrs, Barefoot Stable 9 yrs, Sean Filley 18 yrs, Sean Lake Ranch 20 yrs, Quarter Till Farms 6 yrs, Shizee Arabians 10 yrs, Ewing Arabians 10 yrs, Morgan Arabians 10 yrs, Gattis paint horses 10 yrs, Judy Wiess Appaloosa's 17 yrs, Mid-Evil Times dinner theater 6 yrs and for several veterinarians, Dr. James Grable, Dr. Shane Files, Dr. Scott Hamilton, Dr John Sieler. 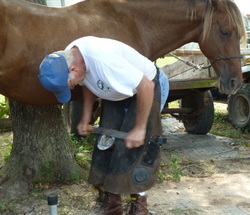 Presently: Owner and Instructor for Tennessee Forge Horseshoeing School held at Calico Junction Mule Ranch 3 yrs. Jim has over 40 years of experience with horses; 30 years with campfire cooking; 20 years of big game outfitting, summer pack trips and packing horses. Jim started and operated the first state Certified Guide and Outfitters School certified by the Colorado State Board of Education and later had the first VA certified Guide and Outfitter Training School. This was an eight week course. and Calico Junction Horse Rescue and holds a SpiritHorse International Certificate as a Certified Instructor for SpiritHorse Equine-Assisted Health Care. 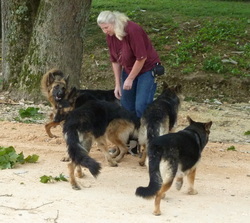 Nancy specializes in mules with over 15 years of experience with raising and training these fine animals. I have the pleasure of creating business cards, fliers, brochures and websites.